Glen Waverley – Saturday September 15th 10.00am – 3.30pm. 8 spaces available. $185 per person. This class is a true 101 class. By the day’s end you have all the know how you need to up-style your old furniture & create unique pieces that will be the envy of all your friends! This workshop requires you to bring along a small piece of furniture to work on. You’ll learn how to prep your piece properly, correct brush technique for both minimal brush marks and extra texture. Learn how to use Fusion’s Decorative Waxes and Glazes to age and/or enhance your projects. Learn the pitfalls to watch out for when painting your own pieces and fast track your learning with expert advice & tuition. A small extra project will give you hands on experience in using Fusion’s texturusing medium ‘Fresco’ and how to create a sharp stencil. Lots of learning, new friends to be made, creative juices to unleash! 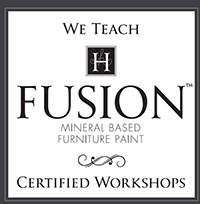 Our product of choice for this workshop is Fusion Mineral Paint. All materials supplied including morning tea and a beautiful Cling On brush to take home..
No experience necessary and even if you don’t see yourself as particularly ‘crafty’ you are guaranteed to love this workshop!